Engineered by multifaceted producer Dan Austin (Pretty Vicious, Mallory Knox and SlØtface) at Stockport's Eve Studios, Real World Studios in Bath and mixed by Russel Church at Seaside Studios locally in Brighton, Electric La La Land offers lots of a variety but is a super consistent first EP. Cram packed with melody and choruses that will stay deep in your mind for some time, this debut EP is a melting pot of melody, fuzzy guitar riffs, strong bass lines and rock steady drum beats that are bursting with energy. It's All Indie caught up with frontman James Hall to explore in detail what Fine Creatures are all about. “We are a guitar band but at the same time we just try to write pop songs. Obviously, we want to grow naturally, our songs are going to change as time goes on. I like bands like the 1975, they are one of my favourite bands, their songs are very catchy. We are quite picky about writing catchy songs, we love pop music. We love having variety in the songs." 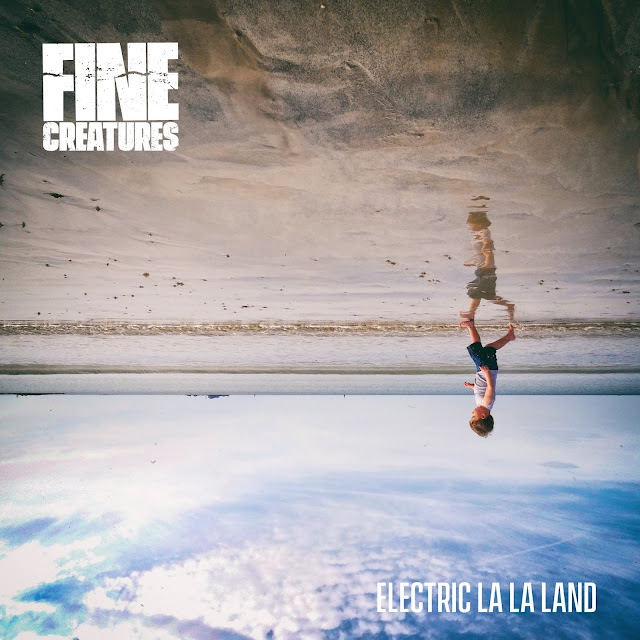 Fine Creatures (James Hall on guitar/lead vocals), Finn Hodgson (bass), Jack Bazzani (drums) an Malte Henning on guitar, the new EP embodies the band's own unique sound, which can be described as alternative Brit-rock. The collaboration with producer legend Dan Austin came about through a family friend connection. "We got really lucky, we met Dan for coffee, he came to Brighton and he saw us there and he was really into the band." "We went into the studio with Dan who has done bands like The Pixies. He is incredible and we are very lucky to have worked with him when we did a while back. He brought the best out in our songs and knew and understood what we needed, a bigger sound because we were a three piece at that point, lot more guitars being done early on and the recordings sound great." "Four days was all it took, it was pretty quick. We managed to get the sound we wanted in that time. Very immediate and lots of energy, it did not take long at all really to get them done. It was very easy for us." "Dan kind of brought another element to the arrangement, he moved things up a gear. It was very organic for us and natural, it was just brilliant. It is a while back now but we still love those songs and we enjoy playing them live." The band are made up of three friends studying at university but the inception of Fine Creatures took place through their experience of shared accommodation and a love of 60s pop and 90s alternative rock. With the later addition of Malte on guitar, the Brighton four-piece is complete and things have really come together for them as a band. The songs are a blend of rough and ready blueprint of pop, grunge and psychedelia, the kind of place where melody meets menace and that makes Fine Creatures such a bright shining hope. Deafeningly loud and energetic, the immediacy of Fine Creatures’ live show has fed into the life and soul of their blistering self-titled debut EP. That spirit is perfectly captured in launch track Birthday Cake - a three minute rush of unhinged pop and volatile rock that demands to be played as loud as possible. Rooted in a quiet-loud dynamic, lifted by the sheer abandon of an undeniable sing-along, and warped by the mad scientist social commentary of James spitting venom at a “bigot”, “just coked up for fun”, evidently this is a signpost of a band bringing the feral nihilism of Nirvana and the joy of The Beatles into a current modern context. "I write most of the songs, if I don't like a verse or an arrangement, then the guys sort of help me, so the songwriting is mostly centered on me. But we talk about stuff, we always communicate things very clearly and make sure we are all on the same page. Although the songwriting comes from me, we finish the songs together. Following the highly successful completion of their tour with Irish grunge rockers Fangclub, Fine Creatures are excited about presenting Electric La La Land to the world, release more material later this year and perhaps play some more shows. 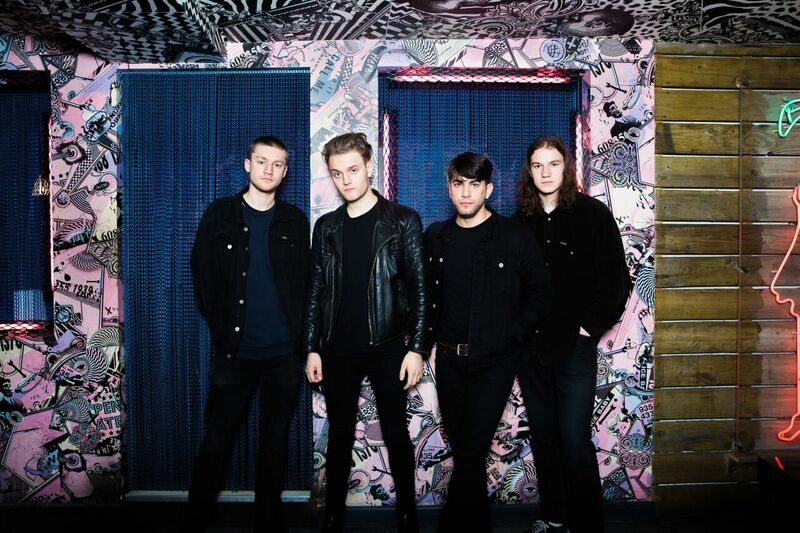 "I know so many bands in Brighton that are great but never really have broken through, it can be difficult when it is over-saturated but I still believe if you write great songs and you work hard enough and you believe in it, then you will definitely get noticed at some point. It comes with good and bad things Brighton, it is great having a huge community but when there is so much then how can you tell what is going to do well and what is not. But it is great, I love it, i would not have it any other way."